Do you love making your own salads at home? Salads are very comfortable to make because it is hassle free and does not require cooking. Salads are healthy, delicious and work best for those who want to lose weight. 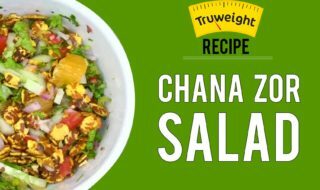 Try this recipe with a twist in which you only need to add some fresh vegetables, spices, and Truweight Chana Jor. Combine all the ingredients except the salt, pepper, and chilli. Just before serving, add salt, chilli, and pepper and mix well.